Former barbecue world champion Kelly Wertz returns to Smokin&apos; on the Pecos. New Mexico’s state championship barbecue tournament was born from a morning of binge-watching the TV show BBQ Pitmasters. Dennis and Vickie Grousnick were intrigued, but not quite ready to leave Artesia behind and tow a beast of a smoker in search of slow-cooked glory, like the roving meatsmiths on the show. Instead they decided they’d host a competition. Starting a barbecue festival would be good for the world of competitive brisket, sausage, pulled pork, and ribs, the Grousnicks figured, and a boon to their town. They checked the list of events officially sanctioned by the Kansas City Barbecue Society and found a “total void on the map” between Dallas and Phoenix. That gap is filled by Smokin’ on the Pecos, June 23–24 in Artesia. Now in its sixth year, it’s what folks in the smoked-meat world call a doubleheader—two full competitions on two consecutive days. 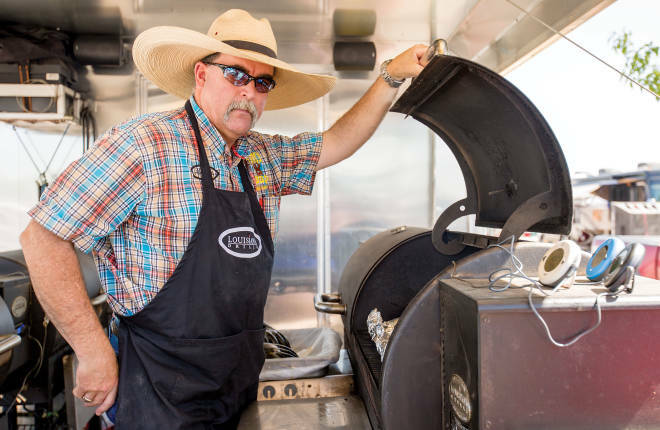 The possibility for double the winnings, plus the chance to capture a state championship—which qualifies winners for national competitions—draws the very best smokers in the nation to the Eddy County Fairgrounds. More than 60 entrants from as far as Minnesota and Florida will wheel in their smokers, from humble black barrels to massive, high-tech trailers, for 48 hours of officially judged meat magic. Besides chrome-covered smoking rigs and samples from the top barbecue teams in the nation, the event brings a carnival atmosphere to town, with food vendors and nightly music.